One of the most thrilling sites in saltwater fly fishing is a school of redfish tailing its way across the flats. These writhing colorful packs of fish are sometimes so charged with hunger and aggression they crack anything that comes near them. When they’re fired up like this, redfish are an angler’s dream. 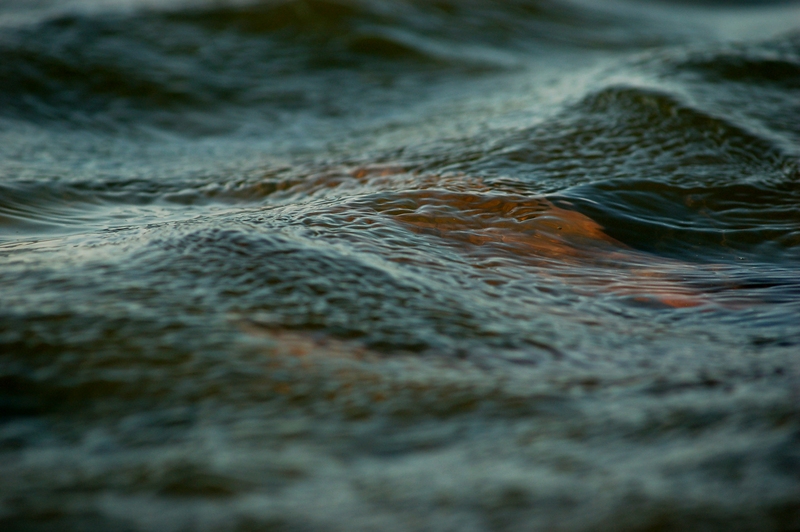 But in spite of their normally cooperative demeanor, redfish (even tailing redfish) can also be selective and spooky. They’ll ignore or even dodge your fly, bolt at the slightest misstep, and vanish before your very eyes. I’ve never quite figured out why redfish get grumpy, but they do. A kayaking trip near Rockport recently reminded me how moody redfish can be. On this particular trip the tides were strong and the weather was nearly perfect. We encountered many different fish throughout the day. There were large schools, singles, doubles, rooters, and cruisers… nearly every kind of redfish scenario you could think of. But, not all the fish we sighted were responsive and by mid-afternoon we were reaching deeper into the bag of tricks and rethinking our approach to catching them. That evening as the sun lost its edge, I paddled back toward the truck and thought about the fish we had caught and the ones we hadn’t. It rekindled some of the redfish lessons I had learned over the years. Here are several that came to mind. When you spot a redfish or school of redfish on the flats, one of the first things you should do is figure out which direction they’re headed. This will help you plan your approach so you can get into position to make a clean cast. 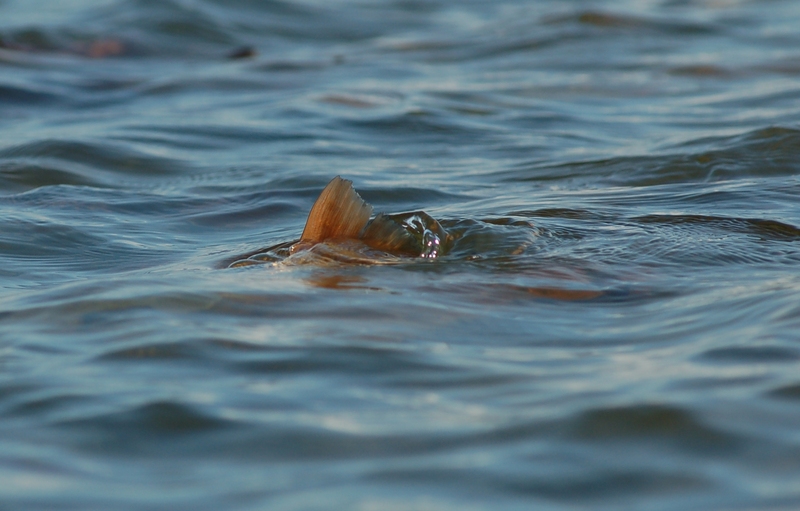 Tailing redfish may poke right or left, but they usually plod steadily along more or less in a defined direction. The direction of big pods of redfish is easy to predict because they make so much commotion. But nailing down singles can be tougher, especially in murky water. Solitary tailing redfish have a nasty habit of slipping under and vanishing just as you’re about to make a cast. Oddly enough, it always seems like a cloud drifts under the sun at that same moment, ruining your visibility. It must be some sort of conspiracy. When a redfish disappears, there are usually two things I do. First, I trust my instincts and I focus on the area I think the fish was headed. Second, I freeze and look for any visual clues that reveal the fish’s location. Sometimes these clues are slight and insignificant, like a few bubbles surfacing or a small raindrop-like ripple on the water. On that kayak trip near Rockport, one fish in particular was a perfect example of how focusing on a small visual clue pays off. While wading back to may kayak after an unsuccessful attempt to catch a few black drum, I heard an unmistakable “chook” sound behind me. I turned to see a large frothy disturbance on the surface with a sliver of pink tail disappearing in the middle. It was obviously a redfish but it utterly melted away in the tea-stained water as I stripped some line off my reel. I waited and watched… nothing. Then I saw a few tiny baitfish scatter along the edge of the cordgrass about eight feet up from where I had seen the tail. I punched a cast ahead of the little minnows and let it settle in for a moment before twitching it slightly. The second I moved the fly the redfish blasted it in a bright orange flash that made my heart jump. In spite of his large size and aggressive behavior that redfish was virtually invisible cruising up the bank. A few tiny minnows flicking on the surface ironically gave him away. A relatively simple way of making an accurate lifelike presentation to a redfish is to lead him. You simply drop the fly in the redfish’s projected path (4-8 ft ahead of the fish) and then twitch it as he closes in. Leading a redfish does not require super-accurate casts or ultra-delicate presentations, and it gives you a few seconds to get ready while the fish approaches. There are two challenges when leading a redfish. The first is timing your retrieve. 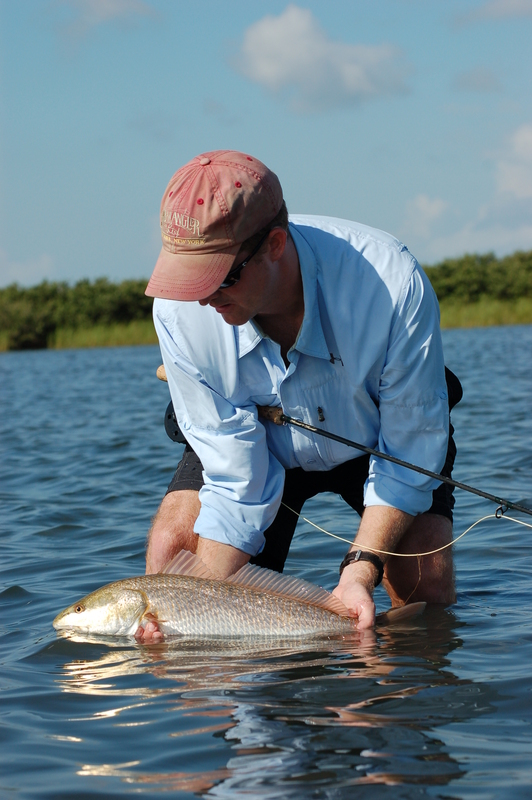 If you strip too soon, the redfish may not see your fly or he may trail the fly back toward you, spot you and spook. If you strip too late, you’ll graze him with the leader or fly which will spook him for sure. The second challenge is keeping your fly from tangling in the weeds while you wait for the fish to approach. Make sure you use a weedless fly or a small popper if you are leading a fish. I watched a buddy of mine recently try to keep up with a school of fast-moving reds. They were tailing quickly across a hard shallow flat into a stout wind and he couldn’t manage to get a clean cast to them. So, he made a quick wide wade, got ahead of them, and dropped his weedless shrimp pattern in their path. 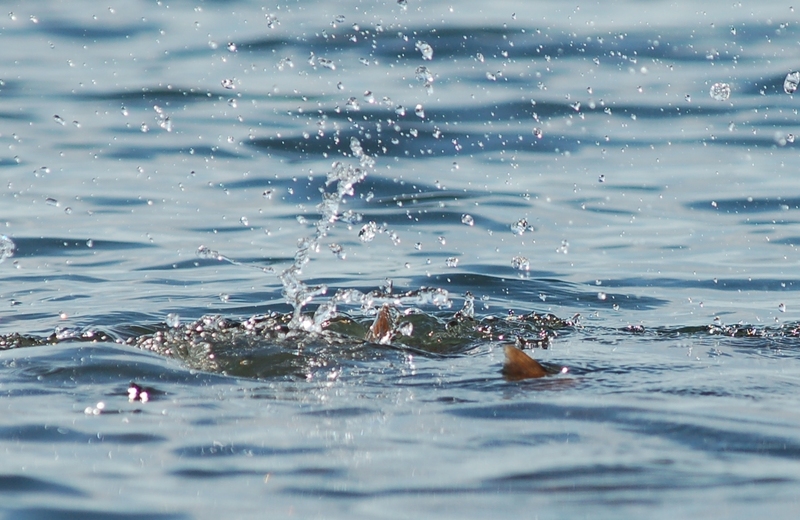 As the redfish approached he stripped the fly once and the lead fish surged forward and whacked it. It was a great solution to an otherwise awkward casting angle. For some reason I still make the bad decision of carrying non-weedless flies onto the flats. And nearly every time I do I regret it. Rooted and floating weeds, cordgrass, and oysters are not friends of the fly. They will spoil your presentation every time… count on it. Even if you think you will be fishing an area with a clean hard sand bottom, carry flies with weed guards or flies that are tied with the hook inverted. Strong tides and shifting winds often carry bits of floating or suspended weeds and grass into areas that otherwise have none. A case in point- I recently cast to and spooked 3 redfish in a row, without ever moving my feet. 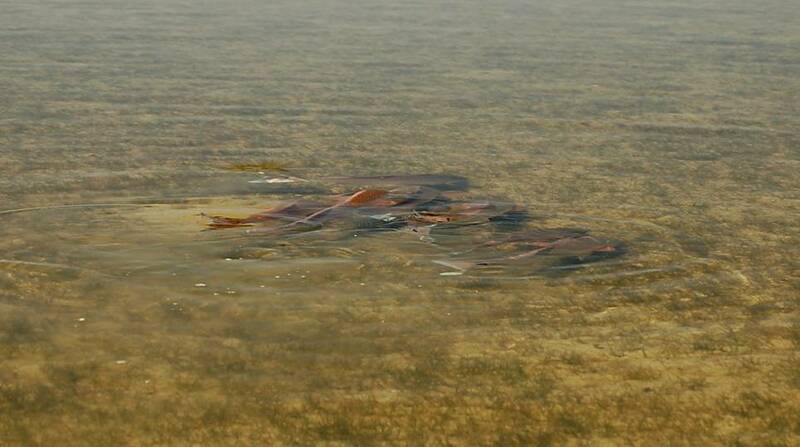 These fish were doing headstands in moderately clear water on a narrow sandbar. A falling tide created a strong current flowing across the bar. It was a killer set up and I was stunned to see these fish bolt from what appeared to be perfect casts. I was about to invoke the 3-strike rule when I realized my fly was getting fouled by small bits of weed suspended in the current. The weeds were snapping free on my backcast, but as soon as the fly touched down more weeds took their place. 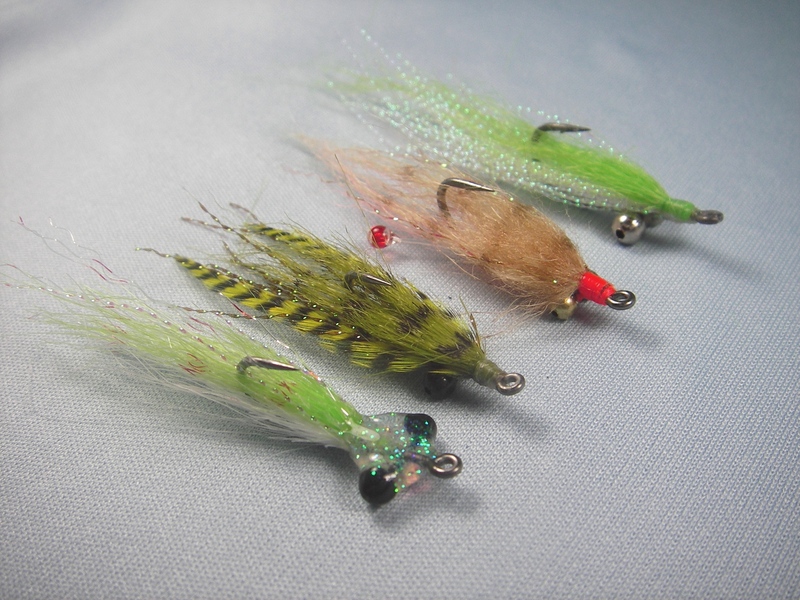 I cut off the fly and replaced it with a weedless pattern which was what I should have tied on in the first place. Lesson learned, again! Until next month… enjoy your time on the water. Great tips and photos here man! Good luck with the redfish!